The oldest meteorological station known to man! ​At the very beginning of Aiolou Street, the street dedicated to Aiolos, the deity of the winds, and within the archaeological site of the Roman Agora, situated on the north slope of the Acropolis, in Plaka, the visitor encounters an ancient monument, of the Corinthian order of architecture, known as Aerides (the Winds). Its official name is the Horologion of Kyrristos or Cyrrhus, since it is thought to have been erected by Andronikos of Kyrristos in Syria. It is an octagonal building, made of white marble from the quarries of Mt. Penteli, 12-meter (36 ft. approx) tall, without columns and a diameter of approx. 8 meters. Each of the 8 faces is 2,80 meter long. The building rests on a base of three steps and has two entrances, to the NW and to the NE. The pediments of the two doors are ruined but the door case of the NW is intact. ​The roof forms a low octagonal pyramid composed of 24 slabs of marble held together by a round keystone. It was originally topped by a weathervane-like bronze Triton, which, turning by the wind was pointing to the section that corresponded to the wind direction. In its interior, almost 7 m broad, there was a hydraulic (water) clock (or clepsydra), driven by water coming down from the Acropolis, to indicate time at night and on days with inadequate sunlight. ​The Tower of the Winds, later called School or The Tomb of Socrates, was used in early Christian times as the bell-tower of a Byzantine church. Restoration work during the Summer of 2015 uncovered parts of a wall painting with a Christian subject matter, testifying to this continuous use of the Tower. Under Turkish occupation it became a "tekke" used by whirling dervishes. It was fully excavated in the 19th century by the Archaeological Society of Athens. Research has shown that the considerable, height of the tower intended to make the sundials and the wind-vane visible throughout the Agora, effectively making it into an early example of a clock-tower. This monument is considered to be the oldest meteorological station known to man. ​Below the frieze there are eight reliefs representing the eight wind deities as winged figures, the names of which are indicated with inscriptions, as: Boreas (North), looking towards Aiolou Street, Kaikas (NorthEast), Euros (SouthEast), Apeliotes (East), Notos (South), Livas (SouthWest), Zephyros (West) and Skiron (NorthWest). The rendering of the winds by James Stuart and Nicholas Revett, 1762. 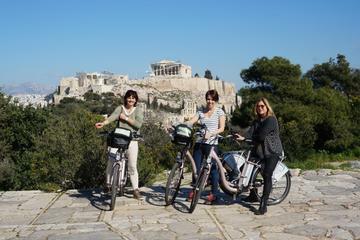 Tick off Athens’ most famous sights on this 3-hour electric bike tour. With an expert guide leading the way and your electric motor doing the hard work for you, cycle with ease around the ancient sights near the UNESCO-listed Acropolis of Athens. Get up close to the Odeon of Herodes Atticus, the New Acropolis Museum, the Roman Agora, Hadrian’s Arch and more. Then, get a taste of local life in the Old Town of Plaka and the vibrant Monastiraki neighborhood. Small-group tour with numbers limited to 12.